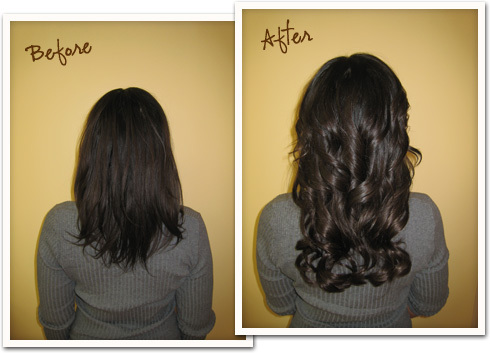 We have the best micro cylinder hair extensions in Chicago! The Dream Catchers by Paris Hilton single strand method is applied using micro cylinders. Small sections of your natural hair are threaded through the cylinders along with the pre-tipped strands, and the cylinders are closed to secure the strands to your own hair. They are designed to be reusable for 4-6 months because the tip does not break down with use. Klix Hair Extensions have technologically advanced micro cylinders that are pre-attached to wefts of hair. Tiny sections of your natural hair are pulled through the silicone lined micro cylinders. The silicone lining cushions your hair and helps to prevent breakage and the skin like weft blends for a seamless application. The Klix Hair cylinders can be opened and closed 3-4 times for tightening appointments before having to be replaced. These methods of application are very cost effective because the hair can be used over and over again. The micro cylinder methods require less at home maintenance than the fusion strands because they are mostly serviced in the salon. On average, the extensions will need tightening services every 4 to 6 weeks.